to take photographs they included on a book cover image (below). THE 3-D PRINTER in the Peabody (MA) Institute Library’s basement Creativity Lab might be what draws teens to the space, but it’s not always what they spend the most time using. One group of boys is fascinated by the sewing machines. “They come in because of the tech, and then they get involved in the [other] things,” says Cate Merlin, teen and special projects librarian for the library’s main branch. Working successfully with teen makers means being willing to step back and dispense with structure if needed. It also means resisting jumping in to direct activities and offer help. Not teaching may be hard for some whose instincts tell them that a hands-off approach diminishes their role and relevance as educators. But it’s central to success in teen maker education, librarians and experts say. The first thing students at New Milford (NJ) High School do when they open a new kit is to throw away the directions and “use it the way they want to,” says library media specialist and author Laura Fleming (see “Don't Let Makerspaces Be A Passing Trend”). That’s a sea change from when the space opened five years ago. “When we first launched, we didn’t know what to do with things that didn’t have step-by-step directions,” she says. “It really has been an evolution.” Now, incoming freshmen already have a maker mentality. 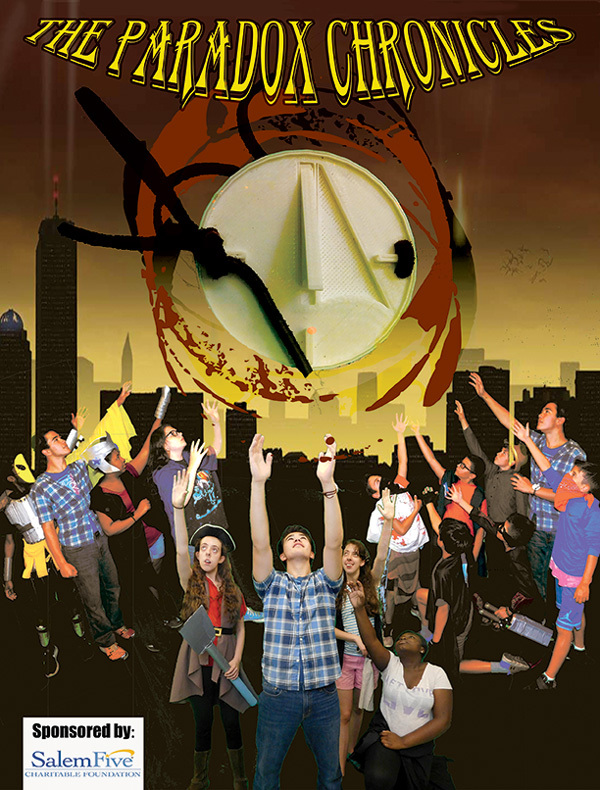 Final Cover image from green screen photo (above). 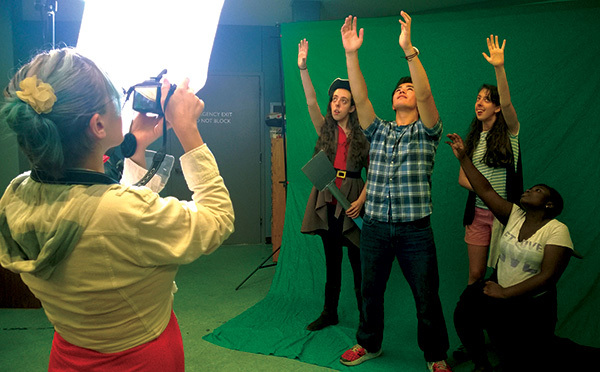 Letting teens take charge of how they use the materials and the space means that librarians leading maker programs take on more of a guide or advisory role. With classroom-based making on the rise, students may be especially drawn to a looser structure in a library. School librarians responding to SLJ’s 2017 survey on makerspaces reported that school library maker programs decreased seven percent since a 2014 survey, suggesting more curricular-based making elsewhere, another reason to let students take the lead at the library. “You’ll never have success at fostering a creative environment if you don’t put the power in the students’ hands,” says Alisha Wilson, innovation specialist at Booker T. Washington High School in Pensacola, FL. “I love that teens can take control. I embrace it.” When Wilson receives a new item for the center, she gives students the responsibility for figuring out how to use it and asks them to plan games or challenges. Giving up control to middle and high school students, however, may not come easily for every librarian or educator. Sandra Hughes-Hassell, a professor in the School of Information and Library Science at the University of North Carolina and 2017–18 president of the Young Adult Library Services Association, says that librarians can create a sense of shared ownership with teens by making sure they are part of the development of the space up front as well as involved in maintaining it. Hiring teens as “tech mentors” and recruiting adult mentors from the community with specific creative skills can give youth the chance to learn from peers or adults who can show how maker skills are used in the real world. At the Best Buy Teen Tech Center at the Minneapolis Central Library, coordinator Amelia Hansa has a teen employment program in which youth with particular areas of expertise are hired to help guide others. When newcomers arrive—and ask lots of questions about how to use a particular tool—Hansa takes an unhurried approach, which allows them to figure it out or ask another teen. Experts like these can reduce librarians’ “anxiety of having to be the expert on all of the technologies,” Hughes-Hassell says. It’s also important for librarians—who might be the only ones in their school or public library working with teens—to stay connected and gain support through a professional community of practice, she adds. This allows makerspace newcomers to learn from others with more experience and advice for working with teenagers. While teens prefer to be self-directed, Hansa always considers the dynamic in the Tech Center to determine whether some “constraints” are needed. If it feels like too much is going on, she might shut down the recording studio for the day. It’s also helpful to have a “few solid things in your pocket”—projects for students who are eager to make but are overwhelmed by the array of choices. Teens come for the social interaction as much as they do the materials, she observes. That became apparent when they began leaving their creations behind. Jensen created a gallery of their work. Peabody’s Creativity Lab occupies the entire basement level of the main branch and includes a 3-D printer, a small milling machine, and a sound-mixing studio. While patrons are free to use the materials anytime the lab is open, Merlin offers a “teen only lab” every Wednesday where they can work on their own projects and receive direction from a “technology savvy and patient” MIT graduate. Merlin and other staff offer classes on skills such as Photoshop, which is more economical than bringing in outside experts. While teens will occasionally come to these sessions, they don’t have the patience to learn alongside a senior citizen without the same level of comfort with tech, Merlin says. They also don’t turn out for events that involve younger kids. Fleming also urges educators to take a close look at whether the purpose of their spaces is too narrowly defined. Focusing on themes in the school curriculum and learning standards instead of the latest tool, she adds, can also open librarians’ eyes to additional sources of materials for makerspaces—especially when budgets are tight. Also, Fleming’s IT and custodial staff members provide materials such as shipping pallets that pupils upcycle into new creations. Community members and local entrepreneurs will often let students try out what they’ve made, and companies look for young people to beta-test new tech tools, she says. She also has teens who have “emerged as experts” in various skills, which allows the spaces to be student-driven and helps others who might not otherwise be successful in school find an area in which they are talented. Students have told her that if the makerspace was a class, they wouldn’t take it. “They like being able to take control of their own learning,” she says. Pull quote photo courtesy of Dover High School.